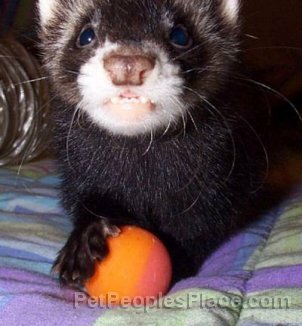 Chicken, turkey, beef, and lamb are all fine; most ferrets don’t like fish, and it may make their litter pan smell worse. The food needs to have 30-35% protein and 15-20% fat, and animal protein should be the first ingredient and at least two or three of the next few. Unless your ferret is overweight, you should just keep her bowl full and let her eat as much as she wants. Cat foods seem to have done okay for many years, but there’s a fair bit of debate about which food is best for ferrets, whether high-quality cat/kitten foods are good enough, and so on. The usual conclusion is that while foods designed for cats probably aren’t the best we could do, most of the foods with ferret pictures on the bags weren’t designed for ferrets either – they were designed for mink or cats and maybe modified slightly, and priced twice as high. If you choose a food packaged for ferrets, check its label just as you would a cat food. There is only one food I know of which was designed and feed-tested exclusively for ferrets, and that’s Totally Ferret, from Performance Foods. Many people feel that it’s the best food, at least for ferrets who aren’t overweight (it’s pretty rich), but most people also agree that cat/kitten foods are entirely sufficient, and that there’s not *that* much difference between them. Most people feed their ferrets high-quality cat food, such as Iams, Science Diet, or ProPlan. High-quality food may cost a bit more than grocery store brands, but your pet will eat a lot less and be much healthier. We’ve found that an 8-pound bag of dry food (usually $10-$15) lasts two ferrets a couple of months, so the cost of feeding them even high-quality food is not very great. Because of their high protein requirement, ferrets up to three or four years old should get kitten or "growth" foods. Older ferrets can have kidney problems from too much protein, though, so they should be switched to the cat versions. Soft cat food is not good for ferrets, partly because it generally contains much less protein than the dry kind and partly because it isn’t hard enough to rub plaque off their teeth and can lead to tooth decay. However, very young kits and those recovering from illness or surgery may need their food moistened with water for a week or two. Note that moistened food spoils much more quickly than the same food left dry, so dump out leftovers every day. Dog food is NOT acceptable, as it lacks some nutrients ferrets (and cats) need. Among other things, ferrets and cats both need taurine, which is found naturally in poultry; many cat and ferret foods supplement it as well. In general, feeding your pet a variety of foods, rather than just one brand, is probably a good idea. Ferrets are known to be finicky eaters, and if the brand you’ve been using changes or is suddenly unavailable, you may run into problems if it’s all your pets will recognize as edible. To switch from brand A to brand B, start mixing them before you run out of A. Add B a little at a time until they’re getting half each, then phase out A.